This is a charming, unique fairy tale. Alberto lives in a village, where flying fish soar out of the sea, and the houses are brightly coloured. The only fisherman in the area is laughed at, after all what use is a fisherman, when fish regularly fall from the sky? Alberto though is a carpenter and spends his time making toys for his three children and household furniture to sell. It is a happy house, until things change, as they do in fairy tales and a sickness arrives at the bottom of the hill. This is a small volume. 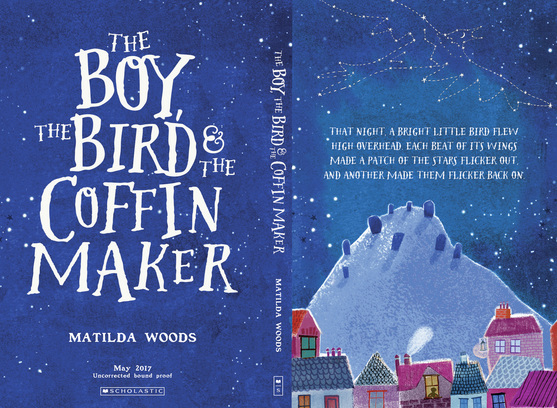 The proof is printed in blue, with small illustrations that decorate each page. It is to be published in paperback, and I hope that Scholastic will make sure that the production reflects the appeal of the story.